Backpack /rucksack with ‘This is not a mobility scooter (or wheelchair) it’s a unicorn on wheels’. Great for chronic illness sufferers who know that laughter is the best medicine and want to get some shopping while out and about. I use mine on my mobility scooter (I just tie the straps together over the seat to keep it on). 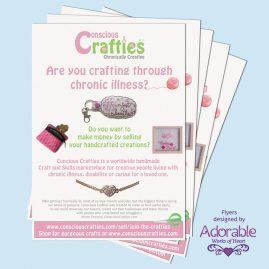 Why not fill it with Conscious Crafties flyers and spread the word. 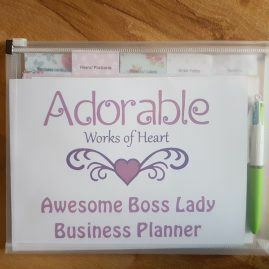 Or add a boss lady business planner (in my other items) to take your business to the next level? You can have anything printed on these (providing it’s not trademarked or copyright). I love unicorns and I get so many comments on this one! ‘This is not a mobility scooter, it’s a unicorn on wheels’. Well, you have to be able to laugh, don’t you? It’s quite large so big enough for all my swimming stuff or several groceries. They are ideal as school PE bags for older children and can be personalised with any name or graphic in my bespoke listing. Please note that styles may vary slightly due to the nature of buying handmade goods from an artisan with no huge warehouse of mass produced stock. The bag is made to order with so much love poured in that it takes me a while to hand make it, especially since I’m very poorly, so please allow plenty of time. I married my wonderful hubby in 2012. 2 weeks later I became very ill. I rapidly lost the ability to walk properly, experienced constant pain and involuntary movements and extreme fatigue. I was admitted to hospital on Christmas Eve 2012 and we missed our honeymoon as a result. I was subsequently diagnosed with Functional Neurological Disorder. It’s one of those conditions that most people have never heard of…including the doctors! My life as I knew it was ripped from under me. I had a full time job working in a school helping young people, an active social life, was physically active and was very independent. That is sadly a world away from how my life is now. I was always creative but now that I’m too poorly to work, I think I’d go mad if I couldn’t channel my limited energy into making pretty things for others to enjoy. It gives me a sense of purpose and I enjoy hearing customers say that they love what I made for them, and coming back for more. I also love that customers soon become friends and I’m thrilled to join this lovely supportive community to meet more Conscious Crafties. If you are not totally in love with your item, I operate a 30 day money back guarantee (excluding custom or personalised items that cannot easily be resold). Please email me within 14 days of receiving your item, indicating if you would like an exchange or refund. Please include date and details of your order: caringcreative@aol.com If you wish to return your item, you will be notified of where to send it. Unless the item is faulty, you’re responsible for return postage costs. Once your return is received and inspected, you will receive an email to notify you that your item has been received. If requesting a refund, your Paypal account will be credited within 5 days. If you have chosen to receive an exchange, on receipt of the returned item, a replacement item will be made. (Please bear in mind that this shop is run by 1 very poorly lady who hand makes everything and if you require a new item to be made then this will take time). In the unlikely event your item needs to be repaired, you’ll be informed how long this will take. I pride myself on happy customers so I hope you'll never need to use this return policy.